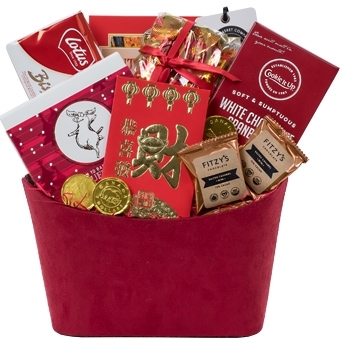 A Chinese New Year gift basket great for sharing and celebrating the Year of the Earth Pig. The Good Fortune gift basket includes: butter maple cookies, white chocolate cranberry cookies, Biscoff cookies, a box of chocolate truffle piglets, Fitzy's chocolate caramels and a red envelope with chocolate coins and lucky candies. As with all our baskets, the Good Fortune gift basket is beautifully wrapped in cello with a hand tied satin bow and includes a gift card with your message. All gift baskets on www.pacificbasketco.com are exclusively designed and made by Pacific Basket Company. See more Chinese New Year baskets.